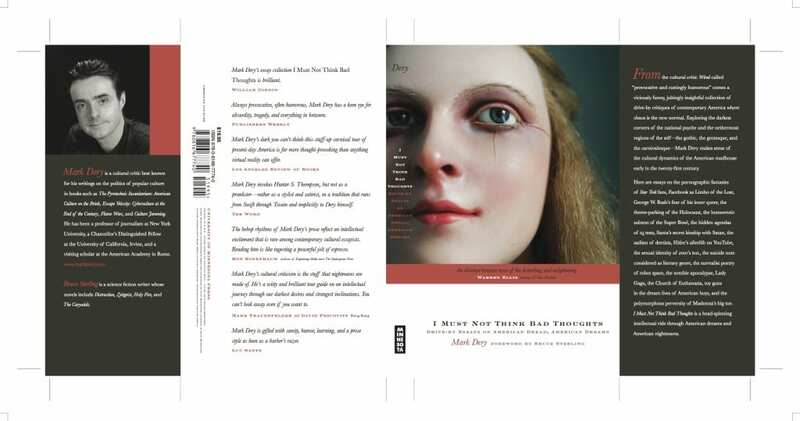 This just in: the revised, final cover for the paperback edition of I Must Not Think Bad Thoughts, due out from the University of Minnesota Press, February 2014. “An absolute treasure trove of the disturbing and enlightening.” – Warren Ellis. This was written by Mark Dery. Posted on Saturday, December 21, 2013, at 11:02 am. Filed under News. Bookmark the permalink. Follow comments here with the RSS feed. Post a comment or leave a trackback. Please register in order to comment. (You won’t be spammed.) If you already have a Shovelware account, sign in to comment. Caveat Scriptor: Obscene, inane, ad hominem, or spam-ish comments will be vaporized. ‹ ALL WORK AND NO PLAY MAKES MARK A DULL BOY: BAD THOUGHTS NEEDS YOU!